I guess I'm going to blog about things a month after they happen, at this rate. I have intended to write, but September was quite a busy month. Better late than never. Rachel — better known as Rachelskirts — is a friend I “met” on Twitter in late 2007. In December 2008, I went to Chicago to celebrate my birthday with some friends and Rachel met up with us. (I just looked through my archives and realized I never wrote about that. Sad. It was a blast — Giordano's pizza, Cinematic Titanic live, coffee, snow.) Her 25th birthday was coming up this September and coincided with the Chicago Jazz Fest. She loves jazz and had an open invite for people to join her. This grew into plans for a birthday shindig better known as Skirtsapalooza. I had a great idea for a present. In addition to jazz, she loves pirates, cats, and coloring with crayons. This well-known photo of her was begging to be made into a pirate photo. Seriously, just look at it and imagine a pirate hat, a parrot on the shoulder, and a hook for a hand. I edited together a coloring page of just that. Then I realized that having her cat on her shoulder made more sense than a parrot — and there happened to be a perfect photo for that, too. I was pretty pleased with the result (see below). Jeremiah and I drove up there and arrived in a timely fashion, however I made the mistake of assuming which Giordano's we were meeting at for lunch. Oops. The correct location was not too far away, though. We met up with Rachel and her entourage: John a.k.a. “Pimp”, Adam, Erica, Nick, and Zach. That was only part of the entourage; Sean joined us after lunch and Erini later in the day. We ate at Giordano's, which is always welcome. Jeremiah had never been before (shock! horror!) but I think it's safe to say he's now a convert. After lunch, we meandered through downtown looking for a Chase ATM (hey Jeremiah, there's a McDonald's) and ultimately, Sugar Bliss Cake Boutique to pick up the 3 dozen miniature cupcakes Rachel had ordered. Then we made our way to Grant Park for Jazz Fest and staked out a nice shady area. We devoured cupcakes and played a fun game of Munchkin. Specifically, The Good, The Bad, and The Munchkin. I had never heard of this game, but it was described to us as a game that pokes fun at role-playing games. I was unsure at first, having never played any RPGs before, but it was pretty easy to pick up and rather hilarious. I'm not sure how to describe it and do it justice, but I recommend checking it out. I plan to get a copy, myself. After a few hours in the park, we were getting a bit antsy. There were ants all over our trash bag. *rimshot*. The group consensus was to go see Scott Pilgrim vs the World. We had some time to kill, so we walked to the theater and stopped in the nearby Target. We ended up in the toy department (duh) and Rachel suggested we could buy Play-Doh and sneak it into the theater. We got the convenient 10-pack and decided we would make totems (ala Inception) and compare after the movie. I recommend sneaking Play-Doh into the next movie you see. After the movie, we had about 30 minutes to walk a really long way so they could catch the train. We walked quickly and eventually parted so Jeremiah and I could head back to the car. A couple minutes later, though, Rachel called and told us the birthday shindig was extended because she was not about to run 10 blocks to catch that train. We ended up going to a restaurant since most of us were hungry. They had breakfast food, too, so I got a cheddar cheese omelette and it was delicious. It was a wonderful day with some great people. We had a lot of fun and a lot of laughs. Thanks for being born, Rachelskirts! 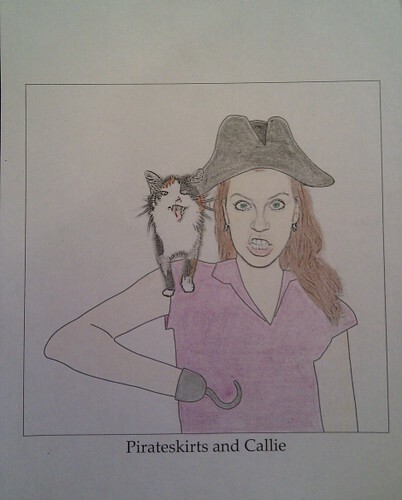 Pirateskirts and Callie. It cracks me up every time I look at it. She loved it. McDonald's McDonald's McDonald's everywhere and not a bite to eat.